I created a tracer page for this week’s verse. 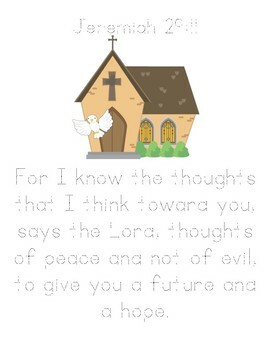 Parker traced his Bible verse while listening to this week’s Sing the Word track. The next day we cut it apart his tracer page like a puzzle and he added it to his Bible lapbook. This week we read about Adam and Eve. This is ALWAYS a great story to review. We talked about the very first sin, disobedience. I brought out our Good Choice and Bad Choices file folder game. Parker sorted the action cards under “good choices” and “bad choices”. We continued to lapbook our Kate & Mack journey. The boys colored the Spanish flag and sketched a few things about Spain. I created a Fall Fun Read and Color Worksheet to go with lesson #9. Parker read each word and colored the fall picture. It turned out so colorful and festive! I created a “quick” compound word worksheet for the boys to complete. This week Jordan was learning about compound words and both boys could benefit from reviewing this grammar lesson. They read, matched, and color-coded the apples that together made compound words. This week Jordan was learning about homophones. I created a “quick” worksheet to review. I drew leaves with homophones and instructed the boys to color-code the matching homophones. The boys did a great job matching the homophones and using all the pretty colors of fall! Last week Parker learned about using apostrophes to show possession. This week we were continuing our study of apples. I read Amelia Bedelia’s First Apple Pie , because it’s one of our fall favorites! 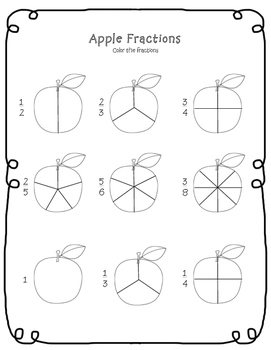 I made a “quick” worksheet to go along with Amelia Bedelia’s First Apple Pie . Parker did a great job adding all of the missing apostrophes. I’m glad that he didn’t forget the rules we reviewed the week before! We read Goodnight%20Moon Goodnight Moon, because Jordan was learning about the moon for Harold%20and the Purple Crayon (Purple Crayon Books) Harold and the Purple Crayon (FIAR study). 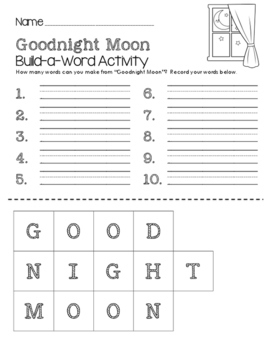 I printed out a copy of our Goodnight Moon Build-a-Word worksheet. Parker colored the vowels red and the consonants green. We changed the extra “O”s to other vowels so he had more letters to work with. He did a great job thinking of three, four, and more letter words! 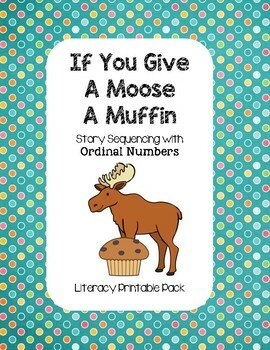 We reviewed ordinal numbers, cause and effect, and story sequencing with If You Give a Moose a Muffin. I created a If You Give a Moose a Muffin Pack for the boys to work on. You can purchase your copy here at our TPT Store. There’s a FREEbie in the preview! I set up a story sequencing activity on Learning Lane. Jordan did a great job placing the items in order. The boys did an awesome job putting the story elements in order. We continued to review fractions this week. I printed out our Apple Fraction worksheet for the boys to work on. The boys both did a great shading each fraction. We made special mini pies, placed three on each plate, and talked about fractions. We talked about the types of pies and what fraction was berry vs. apple. They gobbled them up after answering a few fraction questions. Who knew math could be delicious? That’s all for now….see you next week! These are great activities for learning order and fractions!